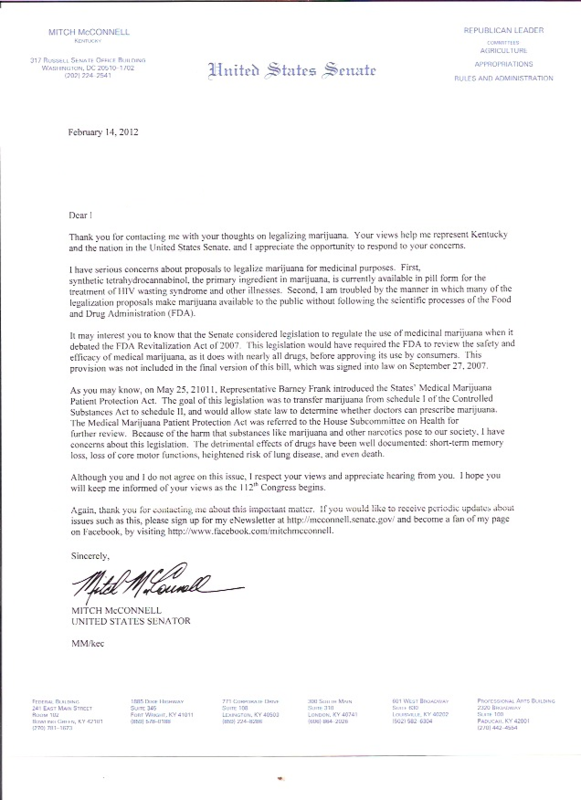 In a February 14 letter to a constituent, Senate Minority Leader Mitch McConnell, R-Ky., told a fellow Kentuckian he opposes legalizing marijuana because it can lead to death. McConnell then cites a medical marijuana bill introduced by Rep. Barney Frank (D-Mass.) and raises concerns about what could happen if it became law—death. “Because of the harm that substances like marijuana and other narcotics pose to our society, I have concerns about this legislation. The detrimental effects of drugs have been well documented: short-term memory loss, loss of core motor functions, heightened risk of lung disease, and even death,” McConnell wrote. McConnell spokesman Don Stewart said McConnell was just making the case that drugs in general have detrimental effects. As cannabis aficionados have noted, state lawmakers modernized Kentucky’s drug laws last year and reduced penalties for low-risk, non-violent drug offenders who possessed small amounts of the drug.